The Scottish Parliament and council elections have become mired in controversy over "spoilt" papers and the operation of the electronic counting system. Here's our guide to the new system. What was different about this election? The papers in the Scottish Parliament election were changed to combine the polls for the regional list vote and the constituency vote into only one ballot paper. As well as being presented on the one paper, the order of the questions was changed to put the regional vote first. Polling for local authority wards also took place on 3 May under a new system of single transferable vote (STV) where voters were asked to rank candidates by order of preference using numbers. This meant there were three different vote counting systems - list, constituency and STV. Electronic counting was also introduced for the first time in a national Scottish election. Why was the new system brought in? The electronic systems were introduced to help speed up the process of counting STV votes for the local authority election, as well as assisting with the Holyrood count. The move to STV was backed in June 2004 as part of the coalition deal struck between Labour and the Liberal Democrat executive. However, the Arbuthnott Commission review of the Scottish voting system, published in January 2006, recommended that the Holyrood and council elections should not be held on the same day. The Electoral Commission also wanted counting to be delayed until the day after voting. The number of spoilt ballot papers returned could exceed 100,000, which some voters have blamed on confusion with the voting systems. DRS Data & Research Services, which implemented the automated counting system, admitted it was experiencing problems with the "consolidation" of the votes. This meant that the calculation of the results took longer than expected and in some cases the process was abandoned for counting to continue, or for a complete recount to take place, later on Friday. Deputy Scottish Secretary David Cairns said in April: "People should have confidence to know that if things do go catastrophically wrong, we will still have the bits of paper and could do a manual recount if needed." How does the automatic counting work? The machines used in the counts scan the ballot papers as they are fed in. In the case of the Scottish Parliament papers the first-past-the-post constituency votes are counted. For the regional list the proportions of votes are registered. On the STV vote the counting machines register the order of preference and then calculate the shifting of votes through the system to rank the preferences, a process which would take considerably longer if carried out by hand. 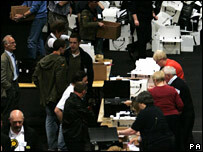 The machines check the number of ballot papers, count the clearly-marked votes and separate those which cannot be read. 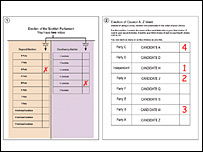 The returning officer can then adjudicate on the unclear ballot papers via a computer screen which can be viewed by all interested parties. Who is DRS and what is its track record? DRS has conducted electronic voting for 10 years in countries including Norway, Bosnia and Herzegovina, Hong Kong and in the London Mayor and Assembly elections. The company claims its e-counting technology is 100% accurate but it is only designed to count clear votes. Sonya Anderson, head of elections for DRS, said: "The process is taking longer than anticipated in some of the centres and some returning officers have decided because of the long wait that the staff and the candidates are experiencing that they are going to ask staff and candidates to go home while we resolve the issue." 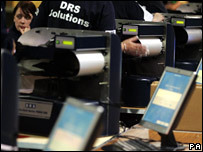 The electronic counting system was being run at a cost of £4.3m. Counting resumes on Friday afternoon to complete the picture of voting across Scotland at the suspended counts in Aberdeen, Argyll and Bute, Eastwood, Edinburgh, Livingston and Linlithgow, Perth and Tayside North, Strathkelvin and Bearsden. The Conservatives said the numbers of spoilt votes had dramatically increased as they had predicted and the SNP branded the postal vote problems, delayed counts and spoiled ballots a shambles. The party's Angus Robertson said: "The Scotland Office, Scottish Executive and Electoral Commission have to answer for bringing Scotland's democratic process into disrepute." DRS again defended its technology, saying the count had experienced a "temporary interruption" to one small aspect of the overall process. A Scotland Office spokesman said: "The independent Electoral Commission will undertake a statutory review into the conduct of this election. "Douglas Alexander, the Secretary of State for Scotland, has today spoken to Sir Neil McIntosh, the Scottish Commissioner on the Electoral Commission, and established that his review will cover the key issues of concern. "Separately, the Scottish Executive has asked that the Electoral Commission's review should cover all aspects of the local council elections."